When most people think of Okinawa, they usually picture – pristine beaches and ocean. While Okinawa is indeed an island paradise, there is much more to do on this unique island. Okinawa used to be an independent nation called the Ryukyu Kingdom until it was forcefully annexed by Japan in 1879. The distinctive Okinawan culture can be observed from a hybrid of eastern and western influences in its architecture, food and even language. Okinawans proudly identify themselves as uchinanchu or “sea people” in their local dialect. I had the privilege to live in Okinawa for some time and I hope to share my love for this beautiful island through this list! Okinawa’s subtropical climate and picturesque coastlines make it an amazing summer destination. Multi-coloured coral reefs surround most islands especially the well-known diving spots around Miyako and Yaeyama islands. Even without diving deep into the ocean, snorkelers can just swim near the coast and get up close and personal with different sea creatures. Beach-goers are pampered by Okinawa’s impressive spread of beaches, especially special sand bars like Kume island’s Hatenohama beach – a sanctuary in the middle of the ocean. On bigger beaches, thrill-seekers can entertain themselves with sea activities like wakeboarding or parasailing. Even just lying on the soft sand or unusual star-shaped sand in Taketomi island’s Kaiji beach and Iriomote’s Hoshizuna beach and taking occasional dips in the waters is a satisfying way to enjoy Okinawa’s world-class beaches and ocean. Okinawa is perfect for island hopping adventures. Island lovers are spoilt for choices as many outer islands are accessible from the main island via car, ferry and even planes. From Naha’s Tomarin port, you can hop on a high-speed ferry and reach the newly minted National Park, Kerama islands in less than an hour. Spend a few idyllic days hopping around Zamami, Tokashiki and Aka islands to enjoy the ocean and interact with the locals at a leisurely pace. Whale watching tours are carried out around these western islands in winter. Far-flung islands like Miyako or Daito islands are worth the flights not just for their sparkling oceans but also unique island culture. For serious island explorers, they can hop around Yaeyama’s archipelago of islands and even venture as far as Hateruma or Yonaguni, Japan’s most southern and western inhabited islands respectively. The gateway to learning more about Okinawa’s culture starts at Shuri, the former capital of the Ryukyu Kingdom. Located on a hilltop, Shuri Castle was originally built in late 1300s and destroyed many times throughout history. Extensive reconstructions started in 1992 and it is the only fully reconstructed castle in Okinawa. Designated as an UNESCO World Heritage in 2000, the castle has a unique architectural style that is different from other Japanese castles. You can embark on a “stamp rally” and explore the castle’s vast grounds before ending your trip with a sunset overlooking the city. Together with Shuri Castle, five castles and four related sites are protected as “Gusuku Sites and Related Properties of the Kingdom of Ryukyu”. Gusuku is castle in the Okinawan dialect, which the locals still refer to it as. These mysterious castle ruins offer insights to the island’s fascinating cultural and historical heritage. Found all over the Okinawa’s mainland on elevated lands, castle ruins like Nakagusku, Katsuren and Zakimi are great places to enjoy panoramic views of the island. Many festivals are held in these castle ruins and a popular one is Nakijin castle’s cherry blossom illumination in spring. Many people are unaware that the beautiful island of Okinawa was one of the bloodiest battle sites during World War Two. Situated near the island’s southern tip, Peace Memorial Park provides a sober but informative look at the devastating effects of the war and the impact on innocent Okinawans. The striking “Cornerstone of Peace” exhibits the names of war casualties to remember them and pray for peace. Not far from the park lies the Himeyuri monument that commemorates women who were forced to work for the Japanese Army. Another war-related site is the Former Navy Underground Headquarters, where many lives perished in the underground corridors and rooms. From the memorials to the ominous presence of American military bases, memories of war form an integral part of Okinawan thought. If you have a chance to interact with the locals, you will understand that they hold a deep reverence for human life and peace. Okinawa’s vibrant culture can be experienced first-hand by attending the local festivities that are associated with customs and traditions deeply ingrained in the society. Festivals are held almost every weekend in summer from Hari, a fishermen’s festival with dragon boat races to pray for safe passage and bountiful harvest to local carnivals with passionate Eisa performances. During Obon (in August), the ancestors’ spirits are believed to return and Eisa dancers beat their drums and dance energetically during this period. A highlight of the Okinawan festivals is tug-of-war competitions with the grandest held during the Naha festival in October. Check the calendar when you are visiting and participate in a local festival to experience the real Okinawa! Surrounded by beautiful coastline in the northern part of Okinawa’s mainland, Ocean Expo Park is filled with attractions for a fulfilling day trip. The park’s crown jewel is Churaumi Aquarium, which is regarded as Japan’s best aquarium. The aquarium has one of the largest tanks in the world and houses the aquarium’s marine celebrity – the whale sharks. Beyond the three-storied building, visitors can enjoy interacting with sea turtles and manatees in the outdoor showcases and watching dolphin shows. Visitors who do not support animal captivity can visit nearby attractions like the Oceanic Culture Museum, Native Okinawan Village and the botanical garden, Tropical Dream Center. Emerald beach at the northern end of the park is a popular spot during summer. The best way to explore Okinawa leisurely is to drive. The most scenic drives are over bridges and highways which link the islands. An easily accessible bridge is Kaichu-doro which connects Okinawa’s mainland to four other islands – Hamahiga, Henza, Miyagi and Ikei. Moving up north, Kouri bridge connects Yagaji island to lovely Kouri island. One of the most spectacular drives is the coastal route stretching all the way to Cape Hedo, the most northern tip of Okinawa. Heading down south, Nirai Kanai bridge is a popular driving spot that offers stunning views of the ocean. Hopping on a one-hour flight from Naha, visitors can reach Miyako and its 3,540-metre long Irabu bridge; the longest toll-free bridge in Japan. 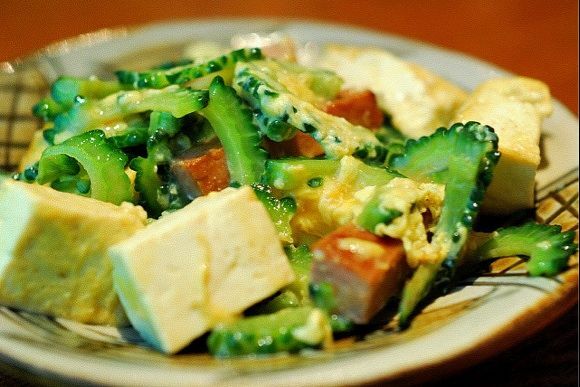 Champuru which means “stir fry” is a staple Okinawan dish prepared by frying various ingredients like bitter gourd or goya, tofu, eggs and meat. The mixing of ingredients in the champuru style embodies the essence of Okinawan cuisine that is characterised by a hybrid of food cultures. A culinary adventure awaits food lovers in Okinawa as they can savour dishes which differ from popular Japanese dishes. The Okinawan soul food, Okinawa soba fills the stomach with thick yellow noodles soaked in fragrant broth and juicy pieces of stewed pork belly or spare ribs. From tender boiled pieces of pork belly (rafute) to crunchy pig’s ears, pork is ubiquitous in Okinawan dishes. Another Okinawa’s signature dish, taco rice reflects the fusion of ingredients from different cultures. Remember to leave some space in your itinerary and stomach to try as many as local dishes as you can! Drinking is an important leisure activity on the island and Okinawans love their Orion beer and awamori. The light Orion beer is perfect for any event especially summer celebrations. More information about this local beer is available in the Orion Happy Park which offers free guided brewery tour and even sample drinks. Stronger drinkers can try awamori. The iconic “island sake” is a distilled spirit made from rice. The most popular drinking style is to drink it with water and ice. Awamori tastes better with age and they are stored in traditional clay pots which are found in the distilleries. The spirit is also a common condiment used in many local dishes. You can’t leave Okinawa until you have tried the local drinks in true Okinawan style! Most tourists will head straight to Kokusai dori, also known as the International Street for their shopping. Stretching for about 2 kilometres in downtown Naha, the bustling street is lined with endless rows of souvenir shops and restaurants. Wander away from the touristy street and visitors will be rewarded with a glimpse of daily life in interesting local shopping arcades like Heiwa dori and Makishi dori. Learn about how everyday life is like for the locals by observing how they navigate these narrow alleys and shop for their groceries. Another popular local market not too far away, Sakaemachi is a bustling market in the day and an eating and drinking haven at night. Kokusai dori. International market. Photo by 663highland on Wikimedia Commons. Okinawa’s traditional arts are well-known throughout Japan. One popular product of Okinawa’s artistry is the colourful Ryukyu glassware. Ryukyu Glass Village is a pleasant place to learn about the glass-making techniques and make customized glass artworks. Bingata, a pride of Okinawa’s art, is a textile-dyeing technique that creates intricate designs for materials which were used to make costumes worn only by royalty in the past. There are a number of shops like Shuri Ryusen which sell handicrafts and conduct simple bingata-making workshops. Yachimum, which means pottery in the Okinawan dialect, is also highly sought after for its high quality and distinctive Okinawan designs. Pottery enthusiasts can stop by the atmospheric Tsuboya district to hunt for pottery treasures or go all the way to Yomitan to explore the kilns and see the craftsmen at work. Immense in Okinawa’s art culture by buying or making these local arts! Venturing out of the bustling cities, nature lovers can enjoy Okinawa’s greenery of mountains and waterfalls. The northern part of Okinawa, called Yambaru by the locals, is rich with abundance of flora and fauna and wildlife. An easy trek will lead hikers to Hiji waterfall and a more demanding hike to Mt. Yonaha, the highest peak on Okinawa’s mainland. More rugged nature is found on Iriomote, Okinawa’s second largest island, which is covered by dense vegetation and mangrove forests. The numerous trekking routes and eco-friendly activities like canoeing can occupy adventurers for a few days. The gorgeous landscape of Okinawa makes it a sporting mecca for sports enthusiasts. With so many sporting events dotting the island’s calendar, it is difficult to decide to run the famous Naha marathon, join the All-Japan Triathlon Miyako island or premier cycling event Tour de Okinawa. Completing physically challenging events is never easy but the scenery and the warmth of the Okinawan people add much energy to the festive spirit of the events. Most sporting events are crowded with supporters from all ages who provide food, drinks and cheer the sportsmen all the way to the finishing line. Okinawa is a magnet for city-dwellers who yearn for a slower pace of life. On the island, Okinawans do not rush and follow what they call “Okinawa time”. A good way to embrace the “Okinawa time” is to spend a day eating and relaxing in a café. Quaint cafés are littered all over the island from Nanjo City to downtown Naha to Kitanakagusuku area and even up north in Nago. 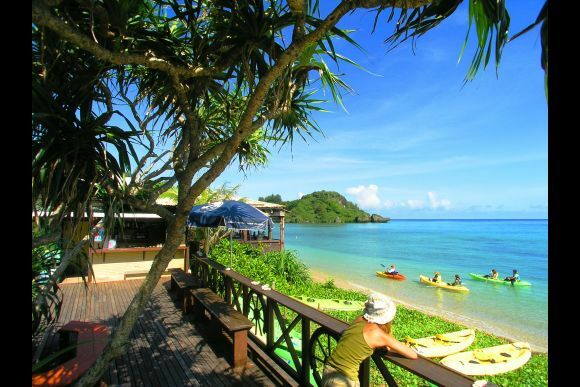 Some cafés serve exquisite dishes made from fresh local ingredients while some offer fantastic views of the ocean. There are just too many excellent cafés for me to recommend. Just pick up any café guides from the wide selection available at bookstores or convenience stalls and visit a few without worrying about time! Experience These Things to Do in Okinawa Yourself!